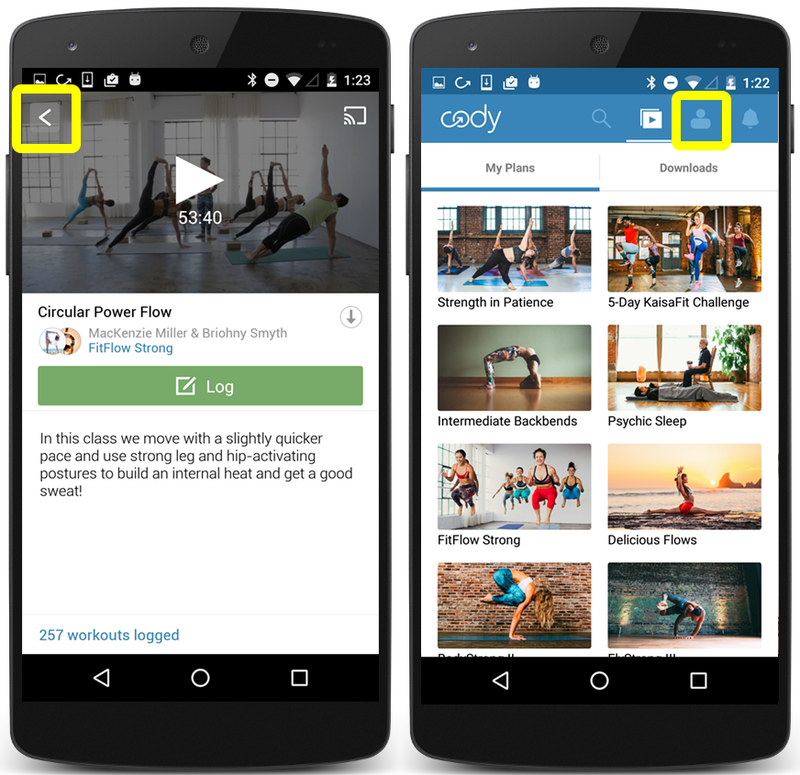 How do I download my workouts onto my Android device? You can use our free Android app to download full plans and individual videos onto your mobile devices for offline access. 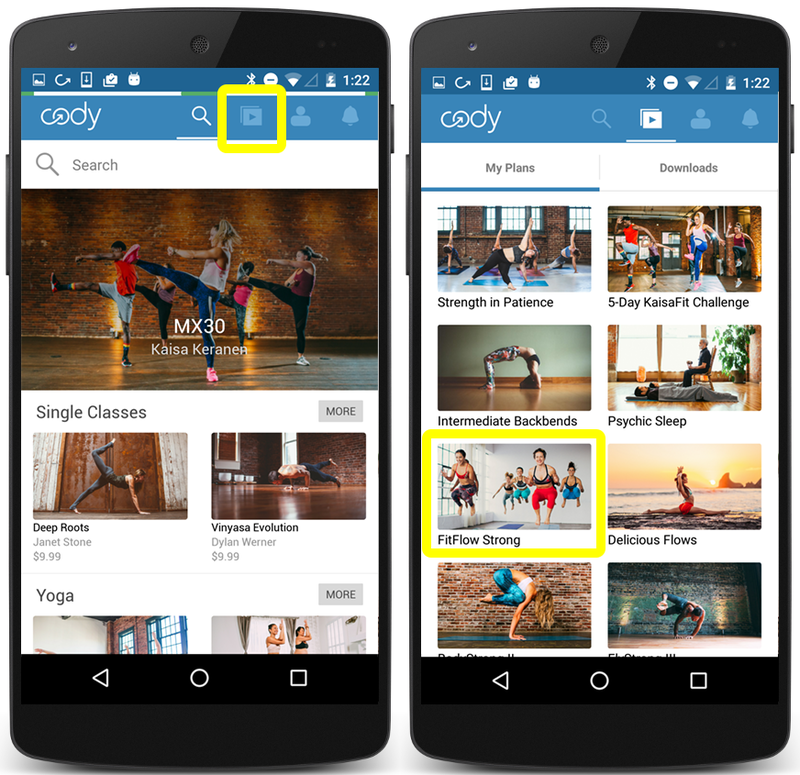 To get our free app, head to Google's Play Store and search for "Cody" - download away! Keep in mind that you will need internet access to download your purchases onto our mobile app, but no internet connection will be needed after your downloads are successful. At this time, the downloading feature is available only on our mobile apps and is not available on our website; desktop and laptop computers will require internet connection to watch our videos. 1. 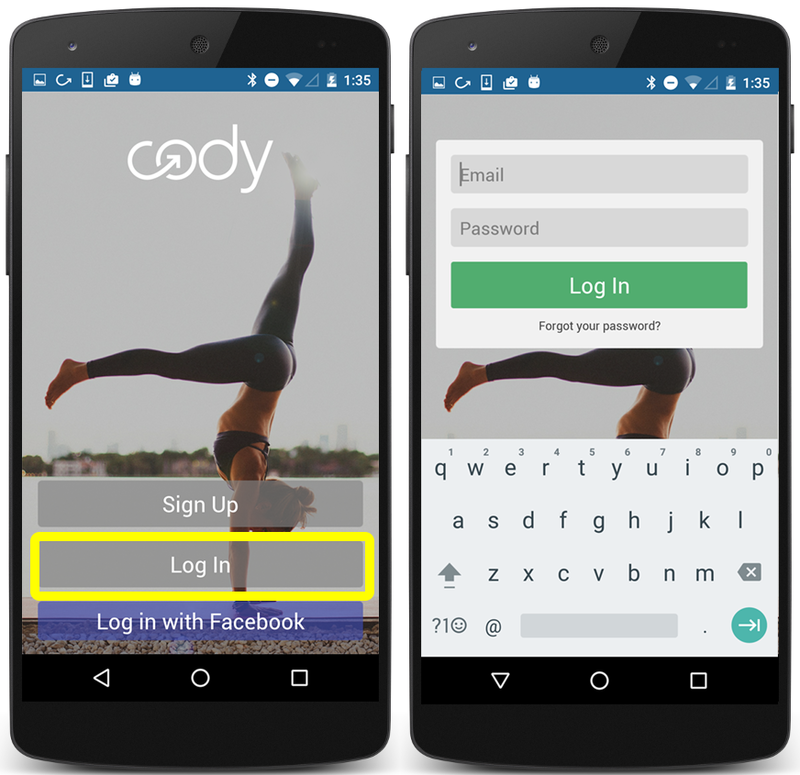 Open your Android app and log into your Cody account. If this is the first time you are opening the app, the screen will prompt you to enter your account information. Go ahead and log in with the same account information you use on codyapp.com. 2. After you have logged in, click the "My Plans" button that looks like a triangular "play" button, located on the top navigation bar. 3. You will see all of your saved plans in "My Plans"; your screen will look similar to the below image. Next, tap the plan you would like to download to your device. You will be redirected to the plan's page. 4. Look for the "Overview / Workouts / Community" heading just below the plan's cover photo. Below this heading, you will see a gray "Download for Offline Access" banner. Click this banner to download the entire plan to your device! 5. 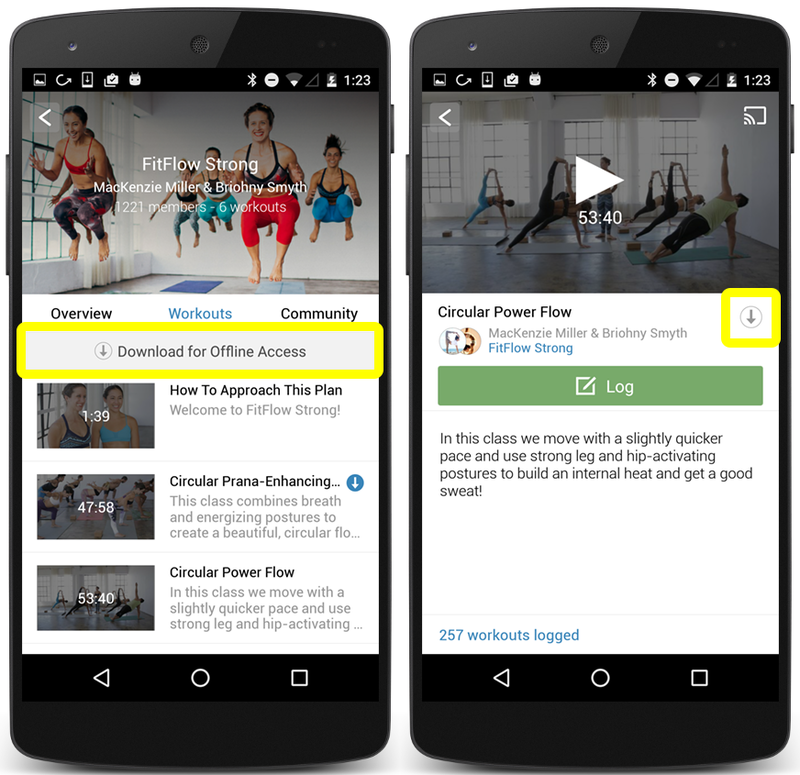 To download a single video (instead of an entire plan), tap the individual workout you would like to download. Once you are on the workout's page, you will see a small gray arrow next to the workout title; this arrow is shown on the above image. Tap the arrow to download! 6. 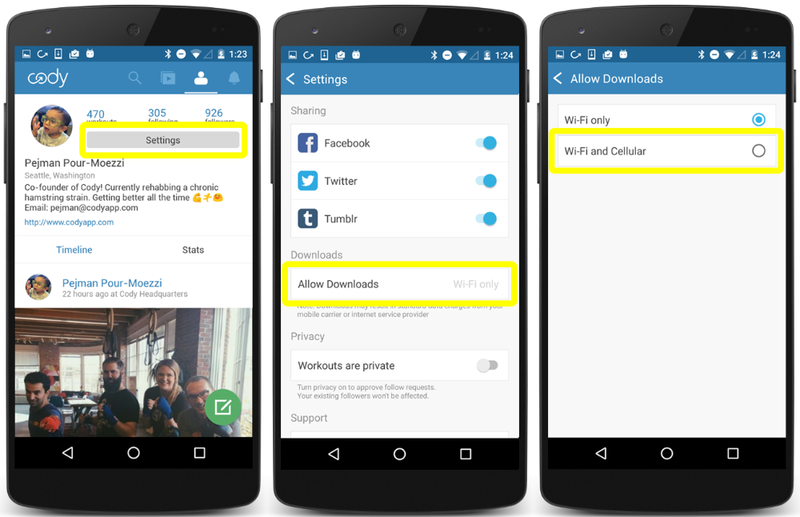 By default, your saved plans will download to your Android app only when you are on Wi-Fi. If you would like to change this setting to also use cellular data to download your plans, head back to your "My Plans" screen. To get to this screen, click the back arrow in the top left corner of the screen until you reach "My Plans". 7. Once you are on the "My Plans" page, tap the icon of a person. You will be redirected to your profile. 8. On your profile page, tap "Settings", located to the right of your profile picture. 9. Scroll down on the "Settings" screen until you see the "Allow Downloads" option. Tap this to change your download settings. 10. The "Allow Downloads" screen will have two options to choose from: Wi-Fi Only, and Wi-fi and Cellular. The default selection will be Wifi-Only. Tap "Wi-Fi and Cellular" to allow your phone to download your plans and videos using cellular data. How do I download my workouts onto my Apple device?